FILE - Taps and water sources are dry in South Africa's almost depleted local dam in Senekal, Jan. 7, 2016. Senekal, a small town in South Africa’s rural Free State province, is one of four regions declared disaster areas as drought dries up the country's heartland. Severe food shortages in southern Africa are expected to grow dramatically worse by year's end, unless the world does something soon. African aid experts say they worry that the continent’s crippling drought may fall behind crises in conflict-ravaged nations like Syria, Yemen, and Iraq, as international aid officials converge this week for the first-ever World Humanitarian Summit in Istanbul. The weather pattern that led to the drought — the famously erratic El Nino — has been battering Africa’s east and south since 2015, first drenching parts of the region with severe floods, and then baking it dry with severe drought. The crisis has affected some 32 million people in Southern Africa alone, and experts say they expect new assessments to rise to nearly 50 million people in early June. Sy said he’ll be pushing hard for attention at the summit. Harvests were poor in April. That food is expected to tide some people over temporarily, but then the situation could take a turn for the worse by July, “reaching its peak between December 2016 and April 2017,” according to the most recent assessment by the U.N. Office for the Coordination of Humanitarian Affairs. 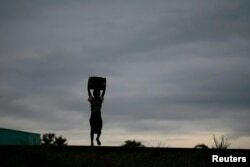 Storm clouds loom as a child carries water from a communal borehole near the capital Lilongwe, Malawi, Feb. 2, 2016. Floods and an El Nino-triggered drought have hit the staple maize crop in the country, a former food exporter. The head of the International Red Cross and Red Crescent Societies visited two nations — Malawi and Zimbabwe — badly affected by drought. here, he found heartbreaking scenes, such as a determined young man digging for water in a dried-out riverbed. Malawi is an especially sad example of how vulnerable these countries are to shocks. In just three years, the once-promising agricultural economy has gone from being able to export food to “a state of emergency,” declared by President Peter Mutharika in April. Malawi saw a 12.4 percent decline in maize production this year, leaving at least 2.8 million people in need of food aid for the rest of this year. Ellen Mkawa, a single mother of five, said she gave up on her maize field because of the drought. But she’s struggling to sell maize at the market. Even South Africa, the region’s richest and most advanced nation, has suffered. Andrew Odero, a regional food security analyst for the WFP, said that the nation will now have to import “substantial amounts” of maize for the first time. He said he also expects prices to rise to the unprecedented level of $250 per ton (4,000 rand). Four of ten children in Southern Africa were already stunted before this crisis hit, according to U.N. figures. Odero said what little safety net people had is unraveling. By next March, nearly half of Zimbabwe’s rural population — up to 4.5 million people — will need food aid, according to the U.N. Development Program. Eddie Rowe, the World Food Program’s country director in Zimbabwe, said the nation’s skewed economy means that it is especially hard hit.